Brian W. Kernighan works in the Computing Science Research Center at Bell Laboratories, Lucent Technologies. He is Consulting Editor for Addison-Wesley's Professional Computing Series and the author, with Dennis Ritchie, of The C Programming Language. P.J. Plauger is President of Whitesmiths, Ltd., New York. Dr. Plauger received a Ph.D. in Nuclear Physics from Michigan State University. He is a member of ACM, the American Physical Society, and the Science Fiction Writers of America. While the book is about software written in Fortran IV (technically Ratfor), the concepts are fundamental and predate object oriented programming. I lost my copy and bought a new one, just to remind myself of its great ideas. 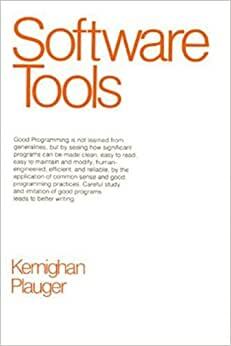 This would be considered fairly standard well-known items these days, but in the context of the evolution of software development this book has been a significant mark along that path. Not just a programming book, a philosophical outlook on how work should be done. It will change how you think and work. One of the classics. It's as valuable today as it was when it was originally written.